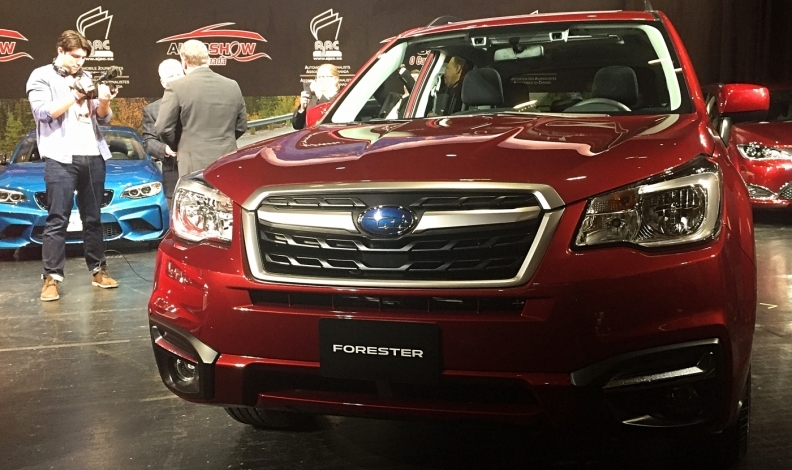 The Subaru Forester compact SUV is the perennial Canadian best-seller for the automaker. There were more losers than winners in April’s auto sales totals, evidence 2017 might not repeat last year’s record Canadian sales. Subaru was among those bucking the sagging trend, posting sales of 5,523 units, up 8.6 per cent from April 2016. Year-to-date sales also are up 9.7 per cent, on track to give the Japanese OEM more than 50,000 sales for 2017. Auto analyst Dennis DesRosiers noted its April sales totaled more than the full-year sales in the mid-1990s. Subaru has achieved record sales for six straight years, he added. “They are truly one of the all-stars in our industry,” DesRosiers told Automotive News Canada. The Forester compact SUV is the perennial best-seller, along with the Crosstrek and Outback crossovers, though the new for 2017 Impreza compact hatchback/sedan has posted rising sales. Subaru has been doing more than holding its own. Its market share has increased to 2.6 per cent from 2.4 per cent in the last 12 months. The growth has come primarily at the expense of Honda, Mazda and Volkswagen, marketing director Joe Felstein said. Subaru is clearly no longer the niche automaker it was through much of its history since arriving in Canada in 1978. It has eight model lines and soon will have a ninth with the introduction next year of the three-row Ascent SUV, filling the void left by the slow-selling Tribeca. But the company has stuck to its metaphorical knitting, DesRosiers said. It pioneered the crossover phenomenon with the original Outback and most of its offerings are compacts – the heart of the Canadian market, the analyst said. Consistent messaging to customers in its advertising and marketing, stresses durability, safety and performance in adverse conditions. “They know exactly what Subaru stands for and know that Subaru is not going to try to be all things to all people,” DesRosiers said. The company has not chased trends and uses features such as standard all-wheel drive (except for the rear-drive BRZ sports coupe) to stress a value proposition versus its competitors. Subaru buyers are mostly in the 35-55 age range, skewing higher than average in education and income, said Felstein. DesRosiers said he believes the other key to Subaru’s success is its conservative dealer strategy. It has not “over-dealered” the Canadian market, allowing individual stores to be more profitable. Subaru currently has 92 Canadian dealerships and expects to stay under 100 for the foreseeable future, said Felstein. It has a growth strategy but feels no pressure to open new locations just to chase volume, he said. “We’re growing at a steady, measured pace,” he said.